When it’s mild, sneezing can feel like a minor inconvenience or nuisance. However, when sneezing becomes frequent, it can cause embarrassing disruptions and spread viruses and disease. When you’re a person on-the-go who’s trying to get some rest, you can manage your sneezing with Contac® Cold + Flu Night – a multi-symptom OTC medication with a maximum strength night formulation. Sneezing is the body’s attempt to rid itself of a perceived irritant. Sneezing can be caused by a cold virus, allergies, chemicals, or a sudden inhalation of particulate matter like dust, all of which irritate the hundreds of sensitive hairs in the nose. In the case of the common cold, the body can sense the virus and, by stimulating the nasal nerves, is attempting to expel it. 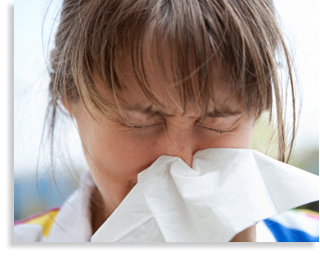 Sneezing is a common symptom of a cold, but is not usually present with a flu virus. Especially among children, sneezing is one of the most common ways a cold virus is spread from one individual to another. If you or your children have to sneeze, always sneeze into a tissue and dispose of it properly, and then wash hands with warm soapy water. While there is no cure for the cold virus once it’s been contracted, Contac® Cold + Flu Night can help you treat the symptoms, like sneezing, that colds are so famous for. All Contac® Cold + Flu products are specially formulated to treat multiple symptoms of a cold and are available in several formulations for maximum flexibility and customization. Though rest is the best medicine, busy parents don’t always have the option of resting when they’re sick or run down. That’s why Contac® Cold + Flu is such an effective tool – day formulations keep you going when you’ve got responsibilities, while night formulations let you rest when it’s finally time. Don’t let sneezing and other symptoms of a cold keep you up when you’re resting, or down when you need to move. Try Contac® Cold + Flu next time you’re experiencing cold symptoms like sneezing.